Sit up (or “sit pretty”) is the classic begging pose. 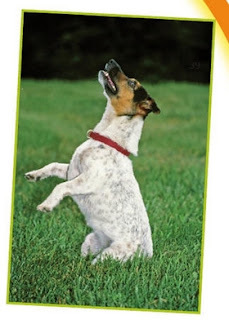 Be aware that if your dog is older and has stiff joints, this trick is not a good choice. Also stay away from it if you have a long-backed dog such as a Dachshund or Basset Hound because these breeds run the risk of hurting themselves. Have your clicker and treats ready. Now ask your dog to sit. Take a treat and hold it in front of her nose. Then move it up and back just a tad to get her to rock back onto her haunches. Once she is in position, you can click and treat or praise and treat. Repeat several times using the treat to lure your dog into position. Then introduce your cue. Give the cue as you begin to lure her into position, then praise her for a job well done. Next, you can try luring your dogwith your empty hand. After repeating a couple of times, you can gradually phase out your hand signal and have her work from your cue.